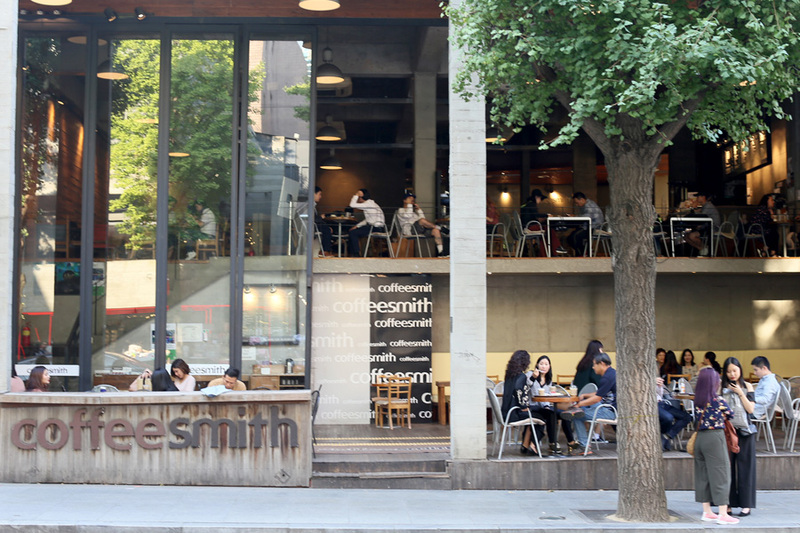 [Seoul] It is not exaggerating to say that every 2 to 3 buildings you cross in Seoul, you will find a coffee place. Sometimes you get a row of them, from Angel-in-Us, A Twosome Place, Caffe Bene, Paris Baguette, Ediya Coffee, and Tous Les Jours. 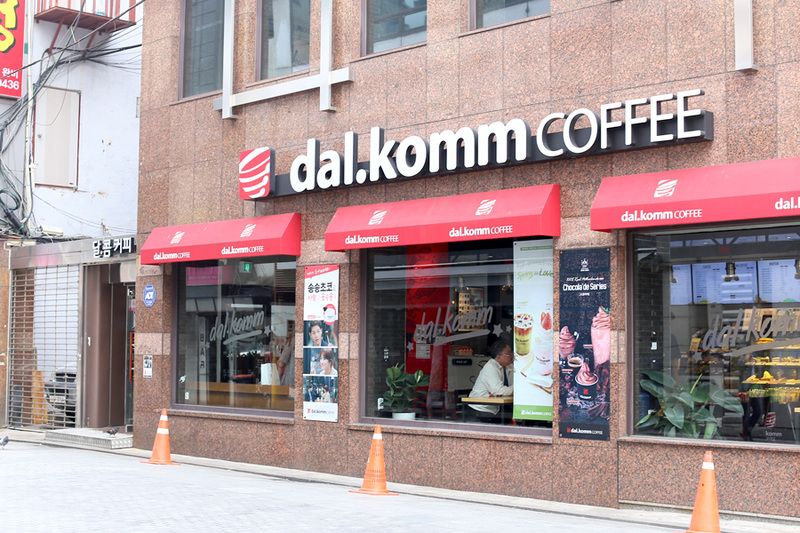 These Korean coffee chains have boomed significantly, given big boys Starbucks and The Coffee Bean & Tea Leaf a run for their money. However, recent article have reported that these chains have reach saturation point, and many have chosen to expand overseas to China and the US. I do not really have a strong personal preference for any, because it would large depend the location I am at. 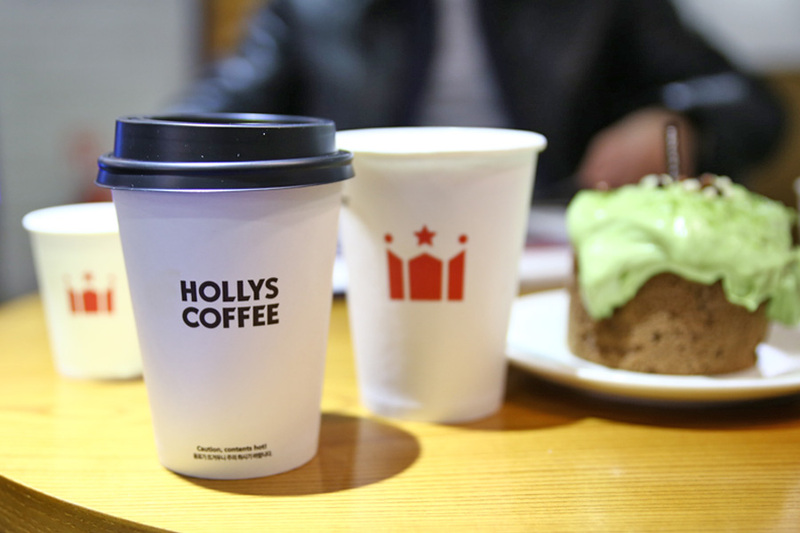 With that said, I like HOLLY Coffee for its ambience and branding, A Twosome Place for the cakes, Tous Les Jours for breads, and Paik’s if I really need inexpensive iced coffee. There are many others such as Droptop, Zoo Cafe, Mango Six, [email protected], and Caffè Pascucci which I would like to try the next time. It has a strange name, but it means, “A cup of coffee, TWO of us, SOME dessert, PLACE”, and is owned by the CJ Foodville of CJ Group. The chain is a coffee chain in Korea with over 500 outlets. It just expanded to the Chinese market with Lee Min Ho as brand ambassador, and is an upscale coffee chain targeting the more affluent market. So Ji Sub is said to be a major investor. 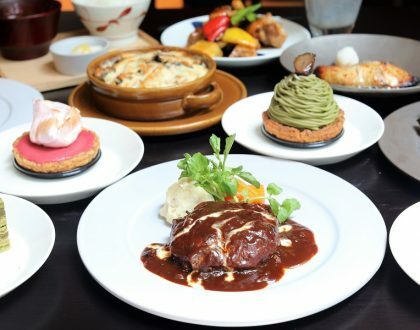 Prices may not be cheap so you can expect to splurge a little at this café. 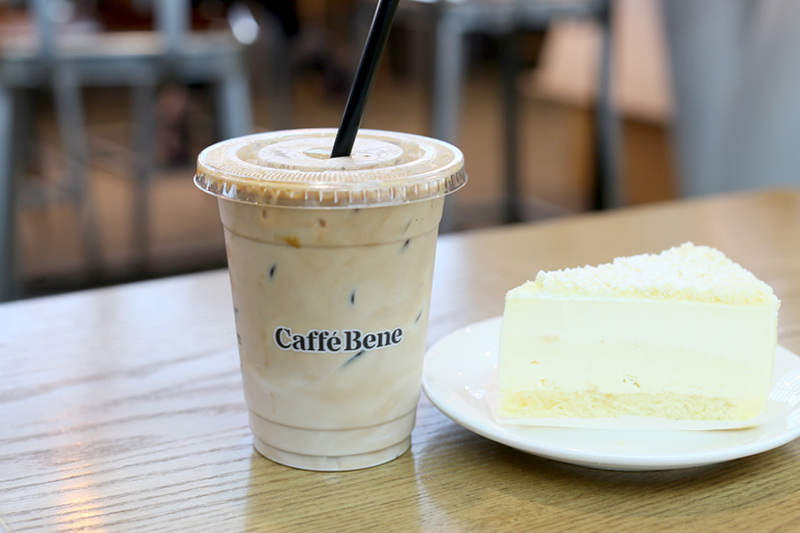 Their coffee and drinks are considered decent, and their cakes above average both in terms of taste and presentation. Some Instagram worthy items include their Red Velvet Cake, Camembert Cheese Cake, and Hot Chocolate. 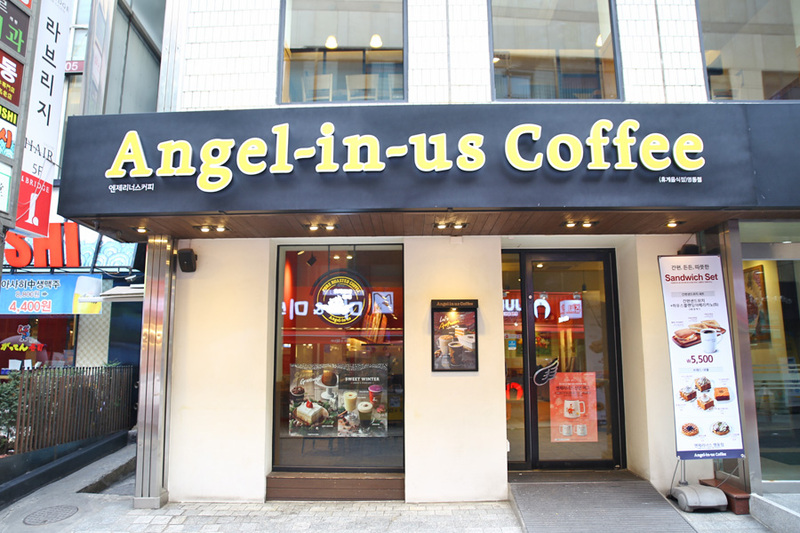 Established in 2006, the name Angel-in-Us implies that coffee is God’s gift delivered by angels, and you may notice cherubic symbols such as wings engraved in all their furniture and cutlery. The place serves typical café fare, although many have noted that their coffee usually isn’t the best or the strongest. However, they make up for this with their pastries and desserts. Some of the to-try items here include the ice cream waffles and siphon coffee. 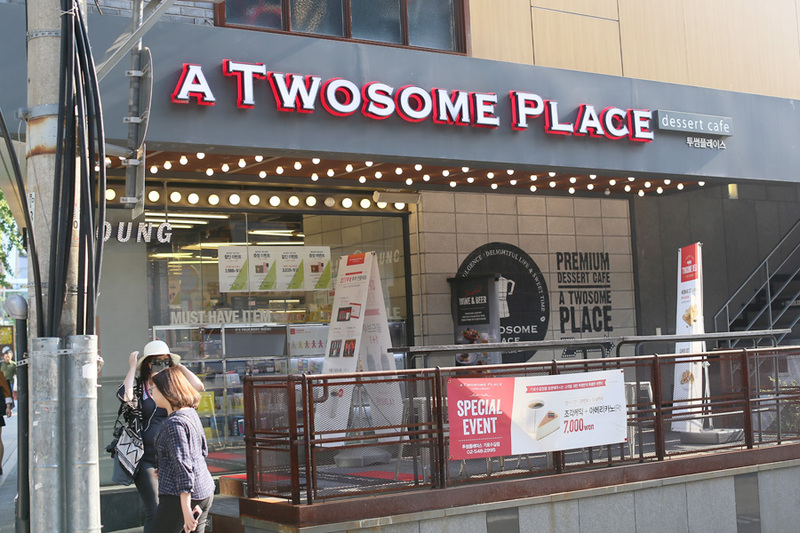 The stores have a relaxing atmosphere are a great place to chill at with outlets in every major city in Korea. The stores also offer free wifi, have reasonable prices, and are popular amongst students. 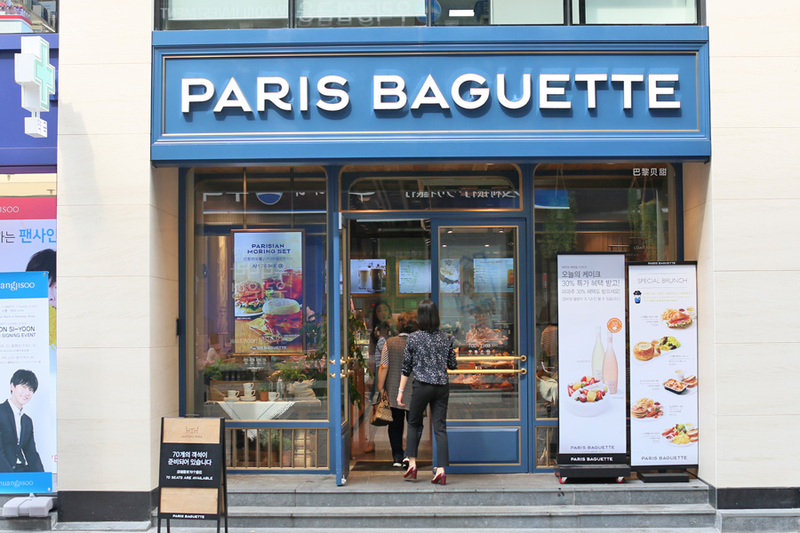 The chain by the SPC started as a bakery-café in Korea in 1988 (launched by Paris Croissant), and serves French inspired pastries and cakes. They have since expanded to over 3500 stores worldwide, and has outlets in the US, China, Vietnam, and Singapore. Other F&B brands The staff generally are trained to cater to tourists, and are capable of communicating in English. The selections of items vary according to the location, and some items available in Korea may not be available elsewhere. The coffee here is average but their freshly made pastries and cakes do cause them to stand out. Some must recommended include Cheese breads, Tiramisu and brunch items of Croissant Set (7,000 Won), Soupbowl & Salad (8,000 Won), and Roast Chicken Doria (8,000 Won). Good to know: Other related brands include Paris Croissant Café (premium bakery café), Pascucci (Italian espresso café), LINA’s and Tamati (sandwich). 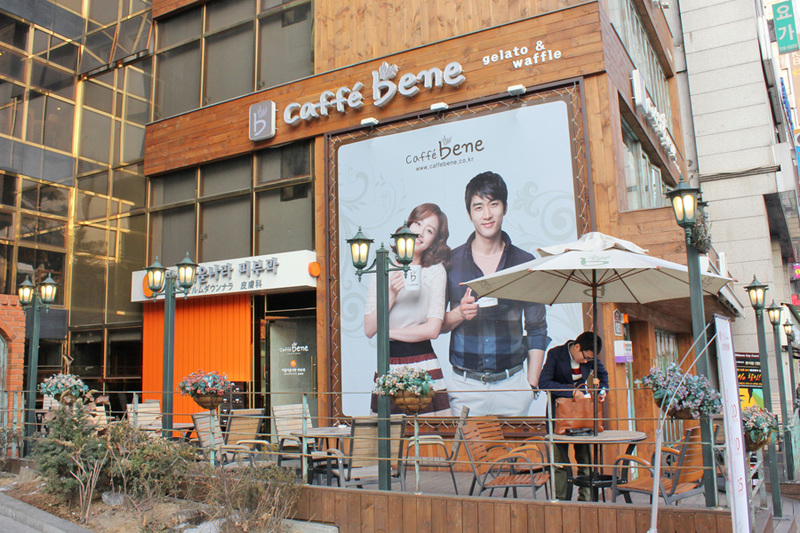 Caffe Bene integrates the whole production line of their beans with a Farm to Table system which ensures that all their beans are of the highest quality. The chain specialises in coffee, using premium beans from the best coffee growing regions in the worlds such as Ethiopia, Colombia, Brazil, and Papa New Guinea. They also operate the largest coffee bean roasting plant in Korea. Some of their recommended include Affogato and Cold Brews. 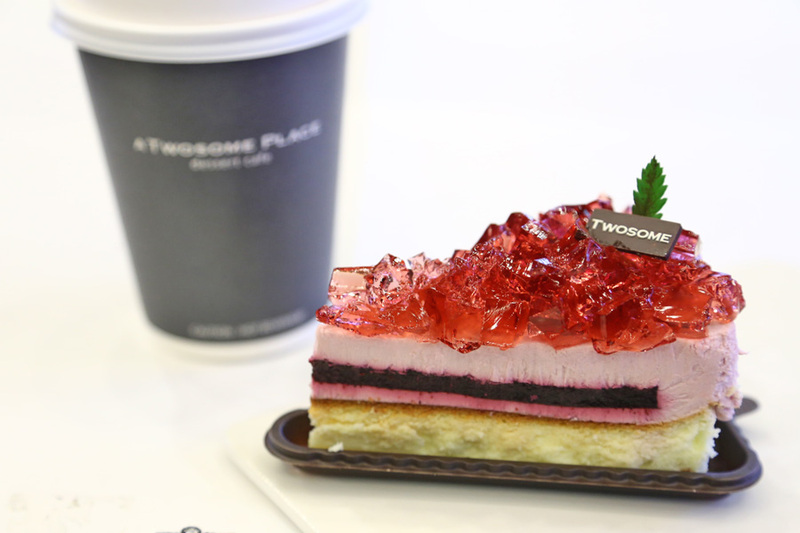 They also have a wide variety of cakes, bingsu, waffles, and pastries to go along with their coffee. One of the key features is the Misugaru, a traditional Korean drink which consists of black sesame seeds, black bean, black and brown rice and barley. 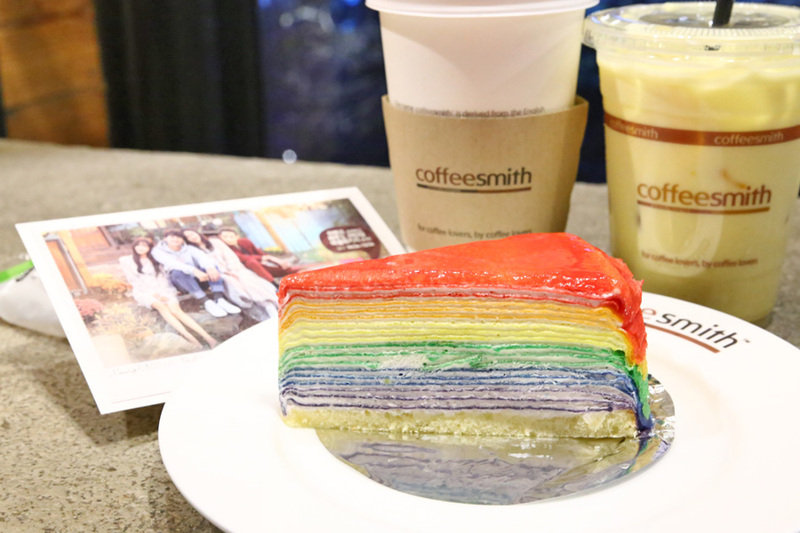 The coffee chain is somehow known for being featured in the hit Korean drama series Descendants of the Sun. However, music is still its unique selling point. The chain has an exclusive app that provides various benefits to its users such as discounts and is also linked to their digital menu board system. You can also use this particular app to order items to your table. Some of the stores also hold regular music performances by specially curated artistes and performers. The interior design of the stores is also designed to encapsulate music and bring the café to life. 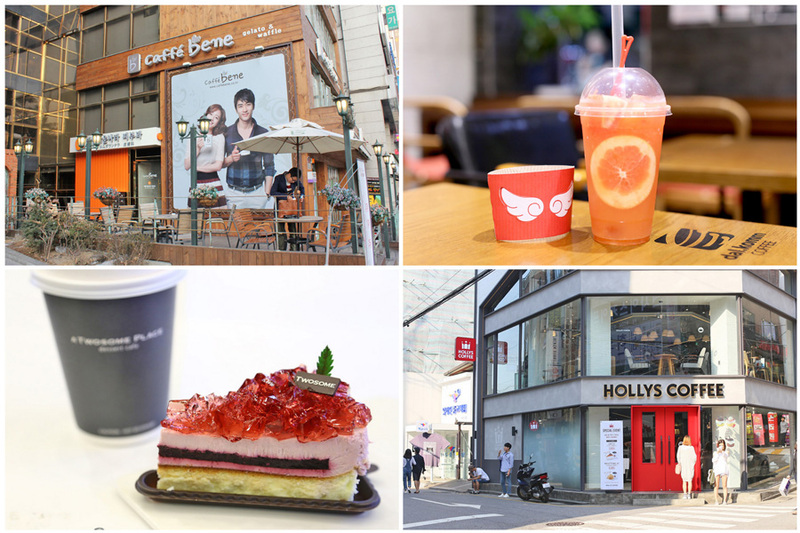 Some of their signature items include bingsu, teas and juices. 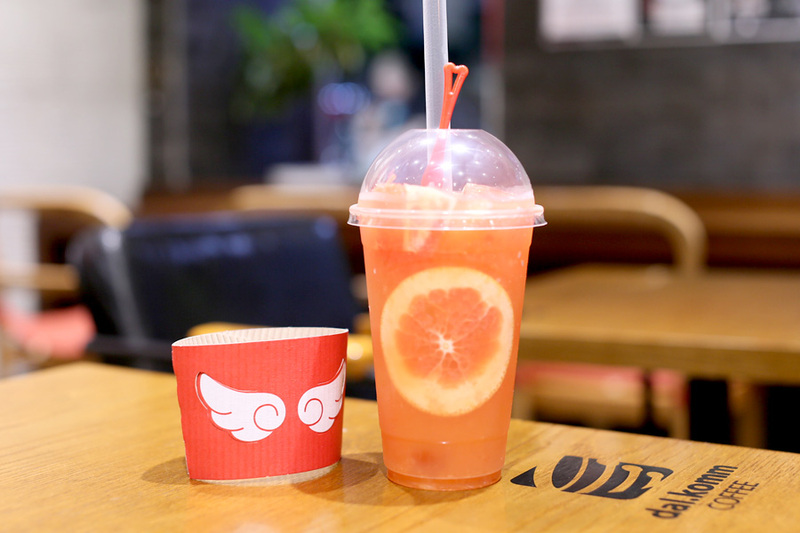 The best-selling drinks include Honey Grapefruit (6,300 Won), Cube (5,500 Won), Strawberry Cube (5,500 Won), Chocolate Shake (6,800 Won), and Honey Hallabong (6.300 Won). Be prepared to splurge a little though, as prices are definitely not the cheapest. The bakery franchise offers an Asian-French selection of baked goods and products, and owned by CJ Foodville, a business group of CJ Group. 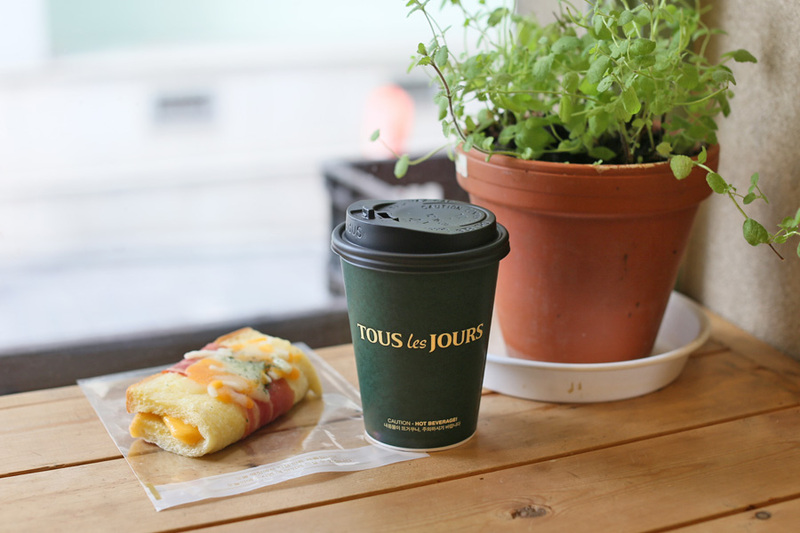 Tous Les Jours means “everyday” in French. 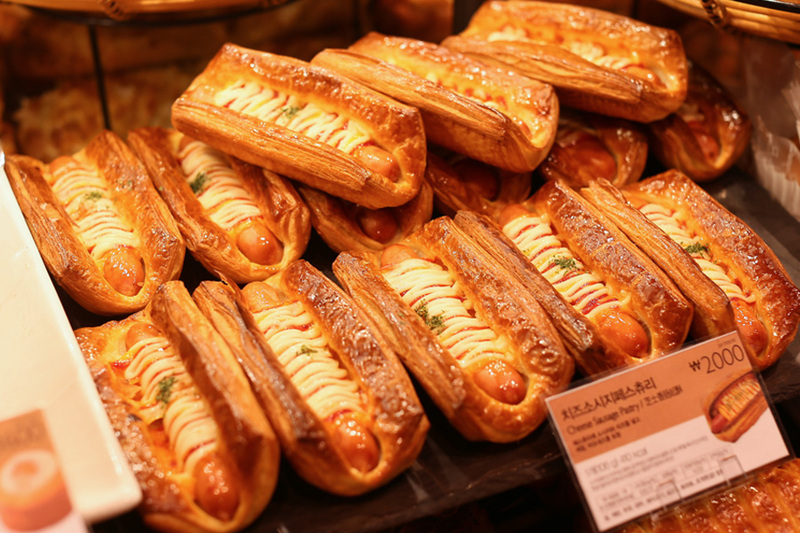 Even though it serves café fare, it is best known for its baked products. Some of its signature products include its Cinnamon Rolls, Brioche as well as its Cream Filled Breads. The chain opened its first store as a bakery in 1997 and later moved on to a bakery café concept in 2003, offering typical café fare in addition to the baked goods. The chain offers a wide selection of coffee, and some of the must tries include the Cold Brew and the Tiramisu Latte. 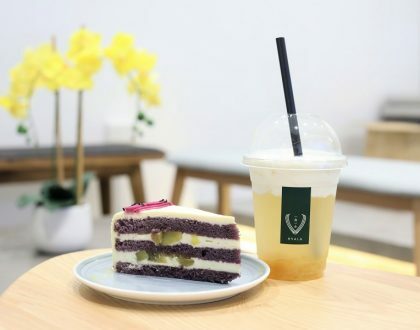 You can also get some pastries or baked goods such as Bagels, Muffins, Scones, Waffles to go along with the coffee, or opt for bingsu as a colder treat. The chain selects their beans through a widely recognised name in the coffee industry, Q Grader, ensuring that each cup of coffee has its own rich and unique flavour. Signature drinks include Americano (4,100 Won), Caffe Latte (4,600 Won), Vanilla Delight (5,100 Won), Sweet Potato Latte (5,500 Won), and Green Tea Hollyccino (5,900 Won). I find this café chain strong in their branding and aesthetics, and many of the outlets are newly refurbished. 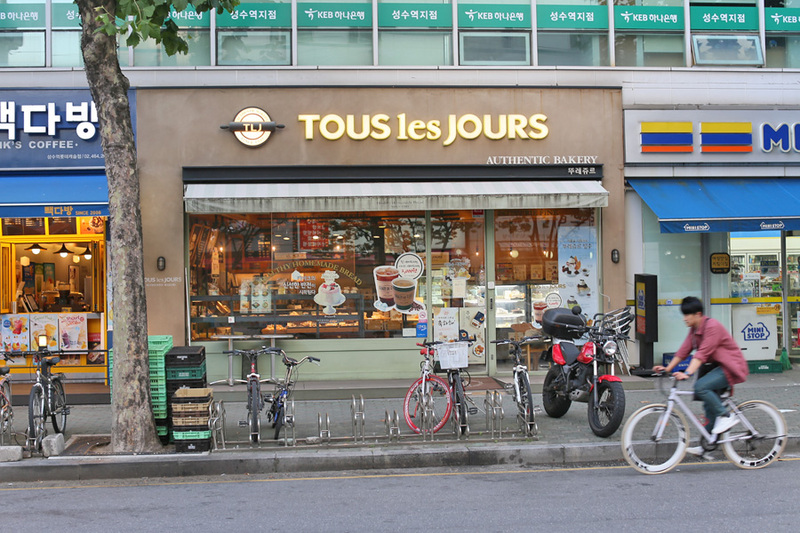 The chain first started out in 2001 in the Apgujeong-dong District of Seoul selling pretzels and baked goods, and later moved on to a café style of operations. 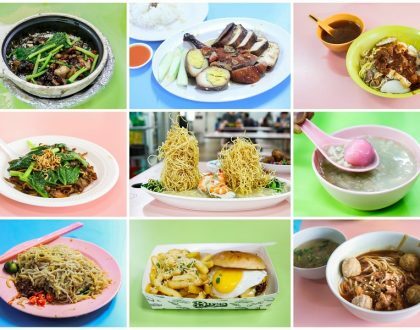 It now has over 400 outlets worldwide including one in Singapore. 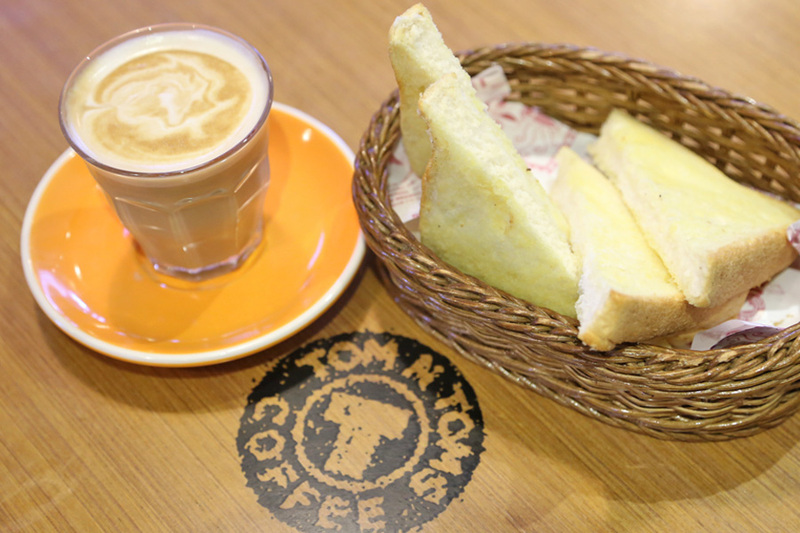 The brand has a number of offerings including Tom N Toms Black which is their original special blend coffee, Tom N Toms Tomscovery which offers a range of tea and coffee products, Tom N Toms Classic which provides a relaxing atmosphere to enjoy a cup of coffee, and Tom N Tom Kids which provides a pleasant environment for kids to relax. Some of the must tries include their pretzels which are a favourite amongst regulars. The chain provides a modernised space in which coffee lovers can enjoy premium quality artisan coffee. The minimalist design of the stores in the chain enhances the original feel of the material, and provides a relaxing atmosphere. Some of the signatures include the more common Lattes and Americanos, but there are also more exotic options such as Snow Shakes. The chain is also ‘for coffee lovers, by coffee lovers’. Each cup of coffee is handcrafted by trained baristas. You can expect a variety from Vanilla Latte (5,400 Won), Caramel Cappucino (5,400 Won), Café Vienna (5,200 Won), to Caramel Macchiato (5,400 Won). 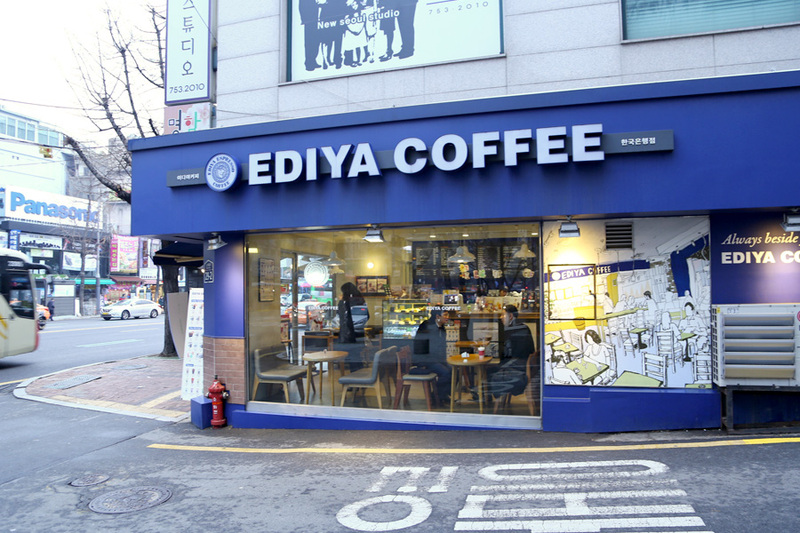 Ediya Coffee claims it is the first Korean café chain to open its 2000th stores. 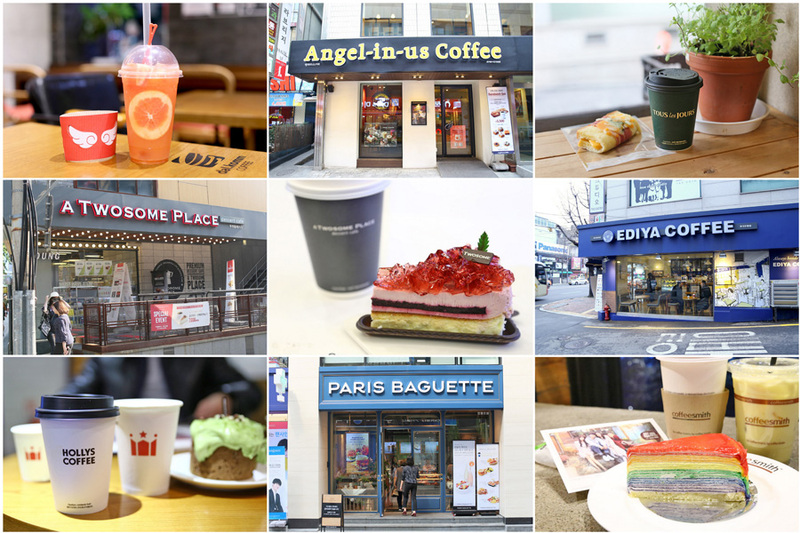 While most of the other chains can be found in prime locations with large-scale stores, some of several stories high, Ediya chooses to open small shops in subprime locations. It also offers coffee (and franchise fees) and lower prices. Some of the varieties include Café Americano (2,500 Won), White Chocolate Mocha (3,200 Won), Mint Mocha (3,500 Won), Sweet Caramel Nut Latte (3,500 Won), Coffee Flatccino (3,500 Won) and Green Tea Yogurt Flatccino (3,900 Won). 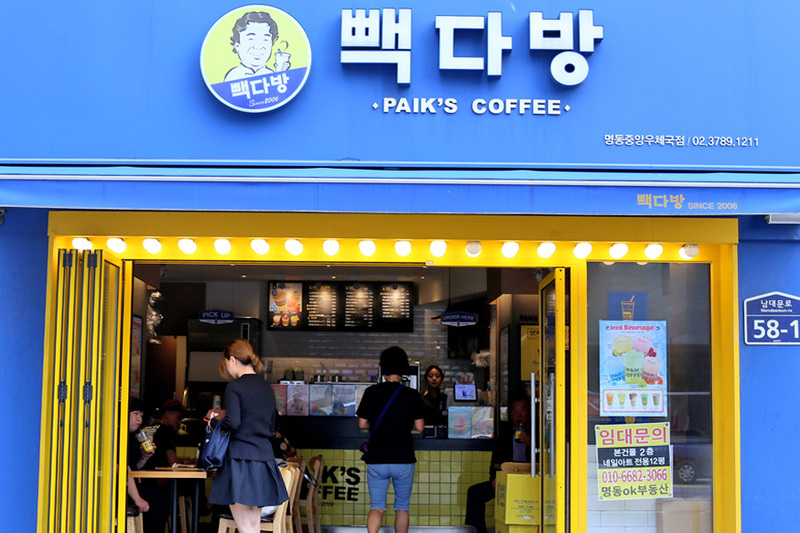 The chain is one of the most popular coffee chains in Seoul as well and it has grown significantly since it first opened in 2006. 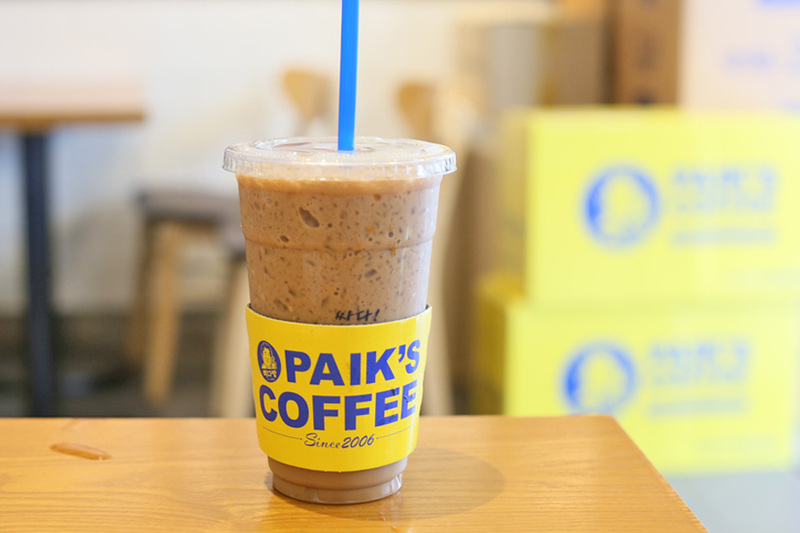 It is known for serving huge cups of coffee at very decent prices, as compared to other popular coffee chains. 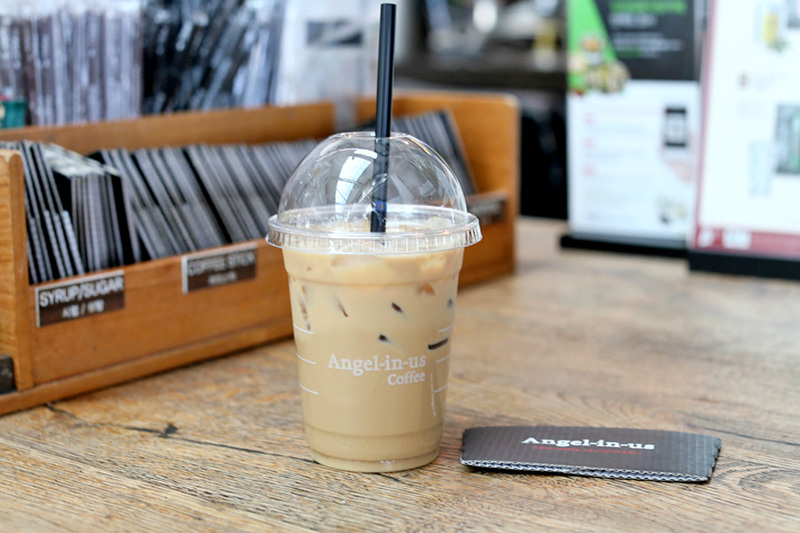 Some of the drinks that are especially popular amongst the locals include their large cups of Iced Americano (2,000 Won), Original Mixed Coffee (2,500 Won), Iced Caffe Latte (3,000 Won), and Iced Caffe Mocha (3,500 Won), and non-coffee beverages such as Milkshakes. 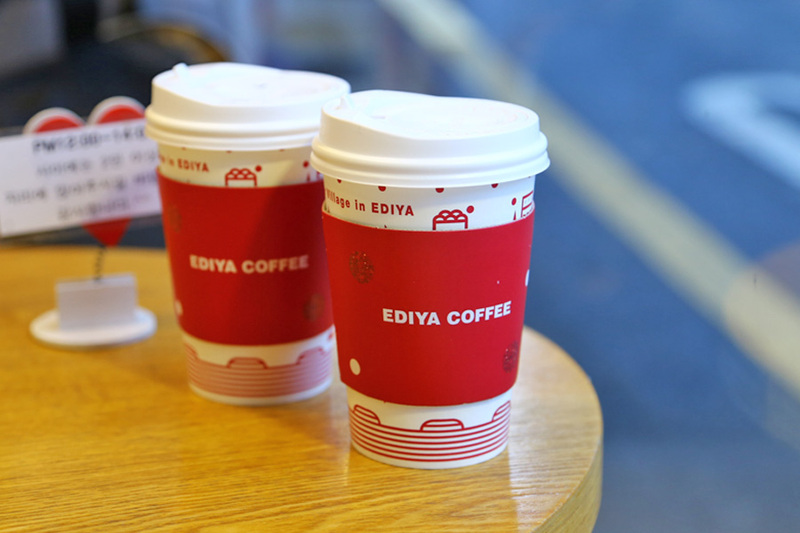 I think that the best coffe brand is Ediya Coffee. 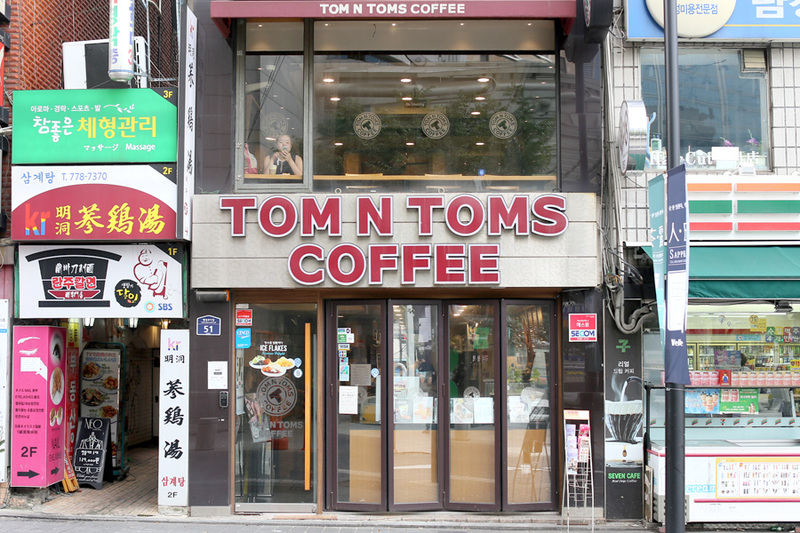 Where is Tom n Toms Kids located? I could not find any in Naver or google. I think,thus cofee the best in Korea.